My foray into making the fresh, spicy Mexican pico de gallo (peck of the rooster), a no-cook garnish for tacos, burritos and any other Mexican dish. Recipe included. Largo, Florida, in the Tampa Bay area, is home to Heritage Village, an open-air museum in Pinellas County. Historical buildings, artifacts, tools, clothes and furnishings depict homes, a firehouse, a gas station, an antique train and many other relics of past Florida living. Here are my photos. Is the St. Petersburg, FL, Hofbrauhaus the same as the original beer hall in Munich? Read this article to find out; I've been to both and make a comparison, including pictures. Learn step by step how to blanch vegetables. Blanching sets color, enhances flavor and prepares fresh vegetables for freezing, canning or cooking. This tutorial shows you how. Simple, light, tasty vanilla cake baked in a lamb-shaped mold for Easter. This cake recipe can be baked in any form or pan for any occasion, but the lamb is a favorite form for Easter in Europe. Learn to make this authentic Irish soda bread recipe for St. Patrick's Day or any day of the year! Serve it up hot right from the iron skillet! Some of you have asked for a homemade cranberry sauce recipe after reading my recent Hirschgulasch post. Europeans use lingonberry preserves for such a recipe, but cooks in the US can substitute cranberry sauce if they can’t find the lingonberries. A fun variation on deviled eggs - make them look like chicks hatching out of their shells! Cute and delightful, your guests will love 'em! Florida vacation - parks, wildlife and friends! A New Port Richey woman, Judy P. frantically called the Pasco County Sheriff’s Department to report a theft of a major artwork from her collection. 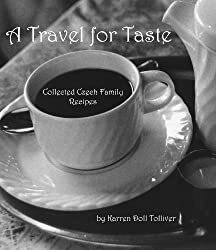 The item allegedly stolen was a copy of Karren Doll Tolliver’s latest book, A Travel for Taste – Collected Czech Family Recipes. It was cleverly disguised as a shipment from Amazon.com.